Just watched a rerun of the Bob Newhart Show where Bob, Emily, Howard, Ellen, and Howie Jr. went to an ice cream parlor that was just like Farrell's except that they had some way to embarrass customers for almost anything they ordered. When Bob ordered a single scoop of ice cream the waiters got together and cried out, "Single scoop! Single scoop!" Here in San Diego County, California, we had a Farrell's in Escondido. One of my brothers had a birthday the day we went. IIRC, he got the San Diego Zoo, the rest of us had either chocolate sundaes, or strawberry sundaes. Suffice to say, we had a glorious time. I grew up in Portland where Farrell's started. They had one resteraunt for a number of years and then suddenly started expanding. When they opened a few more in Portland, I was in high school and got a job there, along with many of my friends. Every shift would involve eating a corned beef on rye and usually a butterscotch sundae. My friend who worked the fountain would periodically "misread" and order and make a sundae for me. What can you do with mistakes but eat them? In those days, there was only the "Portland Zoo". One never knew exactly what went into them... just a lot of ice cream and whipped cream and toppings. The kids would love 'em. I, on the other hand, never ate from one. Duff, you were spot on. I couldn't tell you how many 'Troughs' I ate !!! in North Hollywood, CA. JAHN's Ice Cream !!! What's a Farrel's ??? 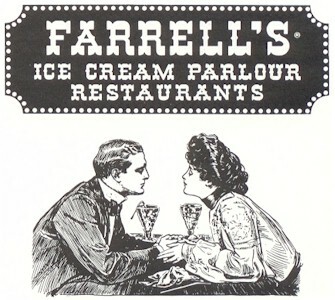 Farrell's has opened a new ice cream parlor in Mission Viejo, CA. My fiance and I went there in Nov 2009, and had a good time with some friends that we went to high school with. The place was packed, and we watched a group of what appeared to be 10 year old boys attack "The Volcano" with spoons. The look on their faces when the staff was bringing the mound of ice cream to their table was priceless. We had a really good time that night. If I recall correctly, they had two huge concoctions; The Zoo (known in San Diego, where I first encountered Farrell's, as The San Diego Zoo), and The Trough. If you finished a whole Trough by yourself, you got a button to wear that read, "I made a pig of myself at Farrell's." They also offered a free sundae to children on their birthdays, and when the chain went under, the U.S. Selective Service somehow managed to buy their Birthday Club list and mailed warnings to boys approaching their 18th birthday reminding them to register for the draft.